One reason is that there are a lot more coworking spaces now, so freelancers have the option of choosing to cowork or work at home, or both. But that still doesn’t explain what benefits you get by freelancing from a coworking space. So we asked some of our freelance coworkers to tell us why. What is it that draws you to a coworking space when freelancers can just as easily work from the comfort of their own home? Listed below are the most common reasons why freelancers who used to work from home are now opting to rent coworking space. One of the things that happens to freelancers is tunnel vision, because you’re doing the same kind of work by yourself over and over again. After some time, it can be hard to just get up in the morning and motivate yourself to start working. The quality and quantity of work you produce also suffers because it lacks that spark and inspired touch you had when you started. Coworking gives you a reason to get out and see the world from a different perspective other than the four walls of your house. You might discover a lot just by stepping away from your familiar surroundings. And those coworkers of yours can make excellent partners for brainstorming sessions where you bounce your ideas and get feedback before you implement them. The people you cowork with represent different industries, sectors and functions. These are all connections that could prove invaluable in your line of work as a freelancer. The person at the desk next to you could be a potential new client, or could send a lead your way. You may even be able to team up with some of them to bid for a project that you can’t do alone. For example, a company that is building a new website will need writers, designers, developers and digital marketers. If you do one of these and cowork with others who do the rest, you could get a lot more work from clients who need all these services. So make it a point to carry your business cards with you and network with the people you work with. One of the disadvantages of working from home is that there are constant distractions. Someone’s at the door, kids need help with homework, food, television, the couch, your bed…everything is a distraction at home. But coworking spaces are designed to be distraction-free, with quiet zones and desk space where everyone is working. It’s a highly conductive atmosphere for working hard for a few hours or the day, but without all the hassles and costs of a full-time office space. Coworking offers substantial cost saving benefits. You only pay for what you use, when you use it. But the business address is yours 24/7, just like a full-time office space. 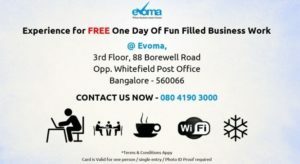 Since coworking offices in Bangalore such as Evoma are located in prime business areas, it’s a great deal if you are able to get a business address and virtual office services along with your coworking space. As mentioned above under Networking, you don’t just grow horizontally (in your firm only), in a coworking space. You have the opportunity to diversify your horizons to include more verticals. A digital marketer may start off by roping in coworkers to help with design, development and creation of website content. But going forward, you may end up hiring employees to fulfill these functions so that your firm has now diversified to provide the full range of website development and marketing services. The best part about working in cowork office spaces is the availability of luxurious offices and executive meeting rooms that you get to use as needed. When you have a client meeting, it creates the right first impression, makes you look professional, and helps you get more projects. For all you freelancers still working from home, think about how many more corporate projects you could bid for and get if you could hold all those client meetings in a professional setting. How great is it that you get to help other freelancers? When someone approaches you for advice in a coworking space, you remember the time when you were all alone at home, with no one to advise or guide you. So you take the time to mentor and help other coworkers. It’s one of the most satisfying things about freelancing and coworking, that you are able to help someone along a bit in their struggle as a freelancer. The best thing about being a freelancer is that you are your own boss. There’s no one you have to report to all the time, and there’s no one telling you what you can do or not do. As per research, people who work without a boss perform better than those who have their bosses on their shoulders overlooking how you work and what are you working on! On the other hand, freelancers miss the office atmosphere, the daily routine, colleagues, after office drinks, etc. Coworking offers you the best of both worlds, with all the good things at the office that you want to be a part of, and none of the headaches such as a boss, a large rental bill, utility bills, maintenance costs, cleaning, etc. A coworking space is like your own personal LinkedIn. If you’re a freelancer who is open to the opportunity of accepting a good job, you just might find the right position waiting for you at the desk next to you. Your coworkers who can see how good you are at your job may even refer you to their clients for an open job position. You pay only for what you use, when you use at your cowork office space. This means you can come and use the facilities when you have a project, or when you’re trying to get one. For example, you can book a meeting room to meet with clients and close a deal. When the meeting is over, you don’t pay any more for use of the meeting room. Instead, you can start using desk space while working on the project. Once you’re done, you can stop paying for the cowork desk space too. So when you have no work, there are no costs. 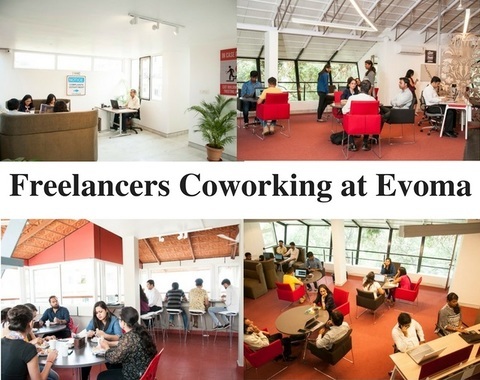 Coworking is the most flexible and cost-efficient workspace arrangement you can get today. Come to Evoma for a day to see how it works for you. Free offer!